Impact Winter - survive at any cost! Authors of books, films and games constantly throw up the topic of post-apocalypse. They develop it, each time coming up from a new side, inviting viewers, readers or gamers to become accomplices, or rather, protagonists, experiencing adventures on their own. What decisions in a disaster situation will be correct, and are you able to find the right answers and take the necessary actions? 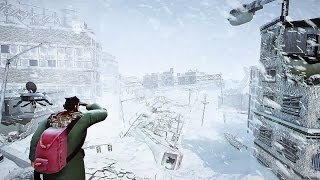 Impact Winter game from the developer and publisher in one person company. Mojo Bones, puts players in a situation where their actions have a direct impact on future events. "Impact of winter" so you can translate the original title. Frost shackled everything around, dropping to the ground when an asteroid smashed into it. This led to a global decrease in temperature, almost all animals and people died. Only a handful of survivors found refuge in a dilapidated church, and the rest is buried under a thick layer of ice. 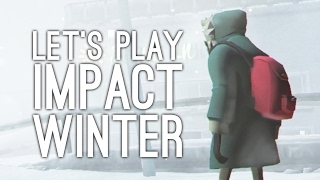 When you start playing Impact Winter, you will act on behalf of the hero who is accompanied by a flying drone. The drone received a weak signal that a rescue team is coming to the city, but it will be able to reach the site only after 30 days. This is the time that we must hold out at all costs, and help the rest. History of the longest winter. To become a participant in the event, you need to download Impact Winter. Now act, remembering the main mission to wait for rescuers. One day you will meet a group of people, and become its leader. You cannot say that you will obey without question, but you will definitely have an influence on them, although this will have to be learned. Survivors have unique knowledge and skills that will be useful for solving certain problems. Sometimes people become discouraged and do not want to do anything. Your job is to keep morale high. Periodically, the situation is complicated, because the weather conditions continue to worsen. Feeling hunger and cold, anyone will break, but once this happens, humanity will lose. Try to find a way to support the hope of the best for all team members, not allowing the mood degree to drop below zero. Any detail can play an important role once. Be creative, and out of nowhere, something will be born. Danger lurks at every step, especially at night, when wild dogs or gangs of marauders go hunting. It’s best not to intersect with them, but if they met, it would not hurt to have a weapon with a spare set of ammunition in reserve. Buy Impact Winter - it is absolutely exactly sustained within the framework of the survival adventure genre. Fans of such tests will go to conquer the uncharted space of the once beautiful metropolis. This is a challenge to a civilized man who has lost the habit of fighting for his own life without the help of the army, the police and other services. By taking on the role of leader, not everyone will be able to justify this title. Orders no longer work, and you can only rely on trust and authority, which has yet to be won by deliberate actions. Interacting with the characters, you will either find the best approach to everyone to maintain morale, or not. But remember that you can only survive together.